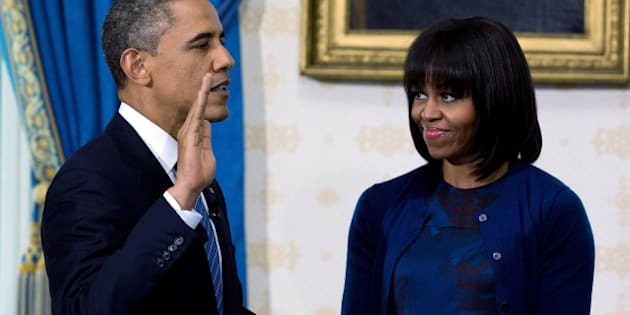 WASHINGTON - Michelle Obama showed off her new bangs and a royal blue dress and cardigan by American designer Reed Krakoff at Sunday's swearing-in ceremony. The first lady and daughter Malia matched President Barack Obama's blue suit, also complementing the Blue Room of the White House, where the small ceremony took place. Younger daughter Sasha, however, went her own way: She wore a lacy pink dress with a gold, wide-width, high-waisted belt — a style her mother helped popularize — and gold shoes. It's not the first time Mrs. Obama chose a design by Krakoff. She previously has worn a gown and jacket by the designer, who also is the president and executive creative director of Coach, Inc. She has carried one of his tote bags, too. Her hairdo, however, is a change — and it has been the subject of online chatter since its debut on Thursday in a photo taken at the White House.